Silloth market takes place every Thursday during the period between Easter and October. The market is located along Criffel Street in the town centre, which borders the recently improved Silloth Green. Stalls open for business early in the morning and trade until 4 or 5pm in the afternoon. Whether you are looking to buy something specific or just to have a look around, Silloth market is ideal for all of the family. An attractive Victorian seaside resort, Silloth offers fantastic views of the Solway Firth and some great visitor attractions. If you wish to join the market, or for more information, contact Phil Byers from Geraud Markets UK Ltd on 07753934540. The Sunday Market at Silloth has been established for well over 30 years. 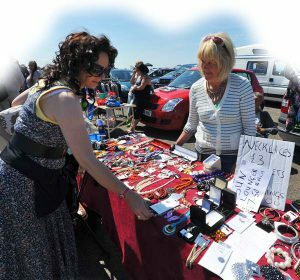 The Market is located on Silloth Airfield just outside the town centre and weather permitting, is open every Sunday and Bank Holiday Monday throughout the season. Whether you travel here to buy something specific or combine your trip with a visit to the family favourite of Silloth’s Victorian seaside resort or the Solway coast’s sandy beaches, you will enjoy a fantastic day out.